Brain Booster Rating: 9 out of 10, the coffee will surely kickstart your brain functioning. I must admit, my coffee routine has gotten a bit boring. Every morning since high school, the first thing I do when I wake up is brew a cup of coffee. Even though over the years I have experimented with different methods of brewing–drip, French press, and now finally a stovetop espresso percolator–the taste of the coffee has remained relatively the same. If your coffee routine has gotten a bit tired too, try adding some spices to your morning brew. Inspired by spiced warm milk my mother made me when I was a kid, I sprinkled cinnamon, cloves, and nutmeg–the flavors of a chai tea latte–on top of the coffee in the percolator before putting it on the stove. (Here’s what to do: remember to just use a tiny bit of cloves and nutmeg because they have really strong flavors. Sprinkle the spices in with the coffee, whatever method you brew your cup.) Even though I don’t drink sugar with my coffee regularly, I added some brown sugar to my cup to cut the slightly bitter aftertaste of the spices. The result was something like one of those Christmastime-spiced pumpkin concoctions that I never get from Starbucks, but without all the unappetizing sweetness. Even though I am a bit of a coffee snob, since I drink a borderline absurd amount of coffee, I usually don’t buy the really fantastic single-origin-shade-grown-$14-per-half-pound roasts because my coffee habit would be too expensive. 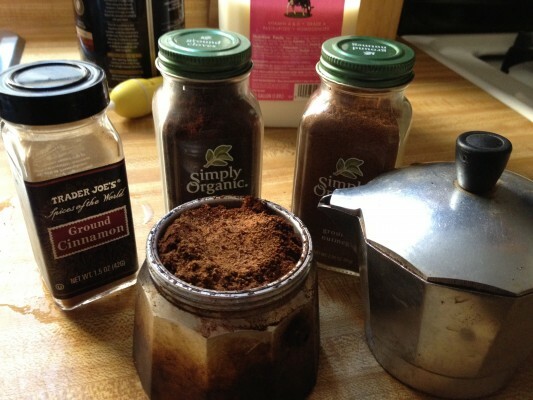 Spicing your coffee can be a creative way to enhance the flavor of okay coffee, a diversion from your normal morning routine, and a thought-provoking addition to your dorm room coffee shop. I put cardamom in my coffee all the time and it’s a much-needed boost. Super delicious!